Hubble Space Telescope is always on the search of something new happening in the space. Recently, Scientists discovered the galaxy that was hiding in the plain sight and was confused with the star cluster. 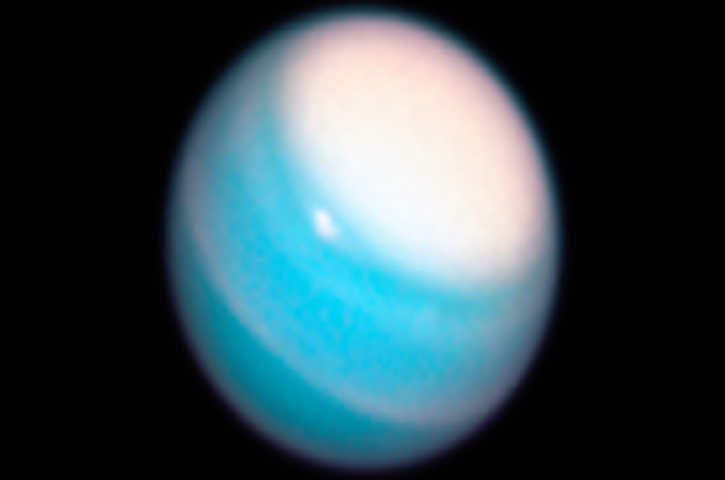 Now, the Hubble is looking at the planet Uranus and capturing incredible images of the same. Currently, the Uranus is going through the summer season, and it is not pleasant at all. At least what we see from the images Hubble has captured. The summer season on the planet lasts for almost 42-years. As the Uranus planet is tilted and the north pole has been facing the sun from a long time, we can see the cloud formations on the side. The summer season is evaporating the liquid on the planet, and that’s why we look at the clouds on Uranus. As the white cloud of methane gas has formed on the north pole and is facing directly towards the sun, it shines brightly so that an amateur astronomer can photograph with his standard setup. Not just the Uranus, but the Neptune is also going through the summer season and has the similar cloud formations of the methane gas. According to the statement from NASA, the Uranus planet has the methane fas in it’s exterior and might have the interior of water and rocks. As the planet is made up of the Methane atmosphere, the red light or the infrared light is absorbed by the gas. That’s why the planet has a cyan blue color. As of now, only the Hubble telescope is sensitive to the Blue light and can capture the crisp images of this planet. NASA also said that they have to take pictures of the Uranus planet to understand the atmospheric changes.